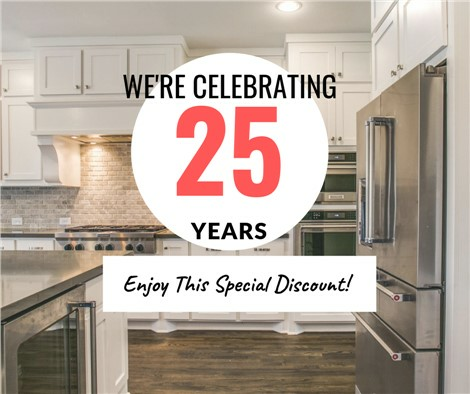 Kitchen and bathroom remodels are the bread and butter of our business and we take great pride in our work. 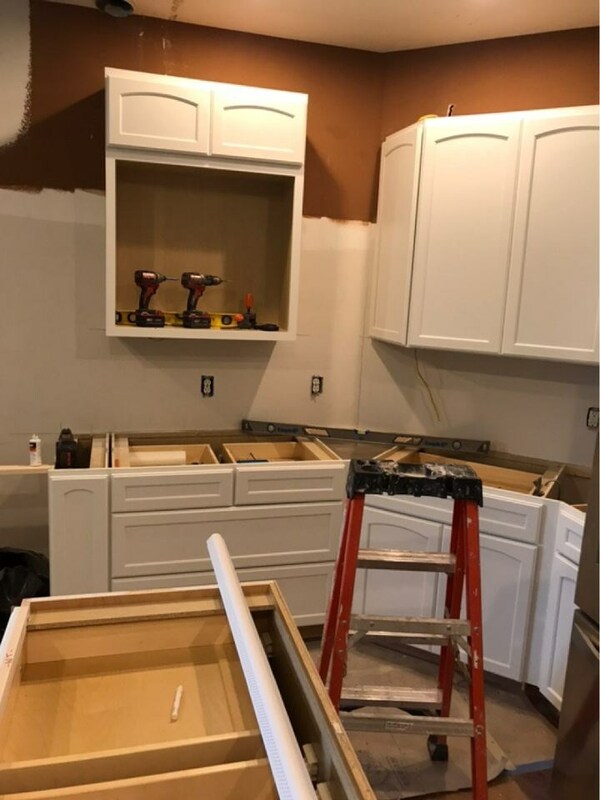 From replacing existing outdated countertops, to painting and installing new features, our crew can do it all! 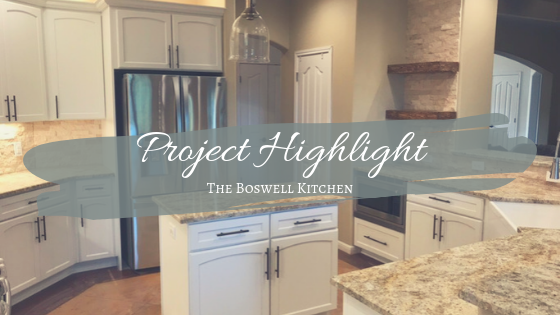 We recently put our amazing team members to work on the Boswell family kitchen and the results are excellent! Check out their hard work below. Demo Day is our second favorite day (after reveal day)! 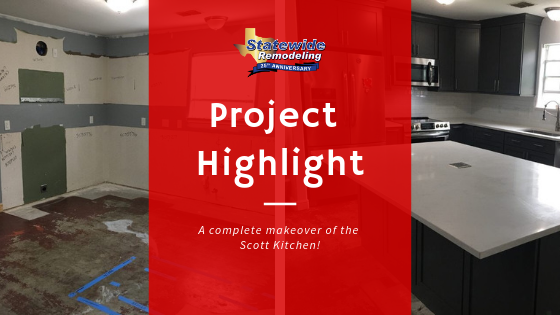 The crew cleared out the old countertops and planned, measured, and measured again so everything is to the exact specifications of the homeowners. 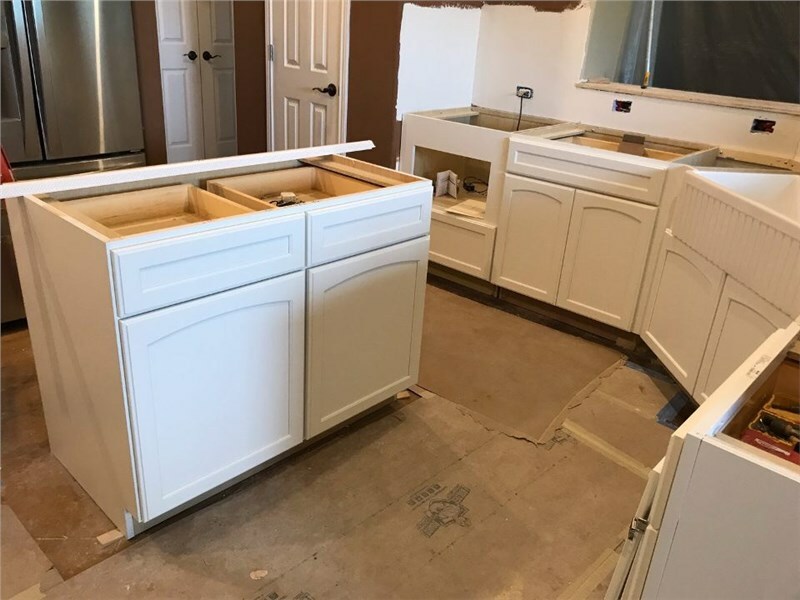 At this stage, appliances like the microwave and dishwasher are removed to protect them from the chaos happening around them. 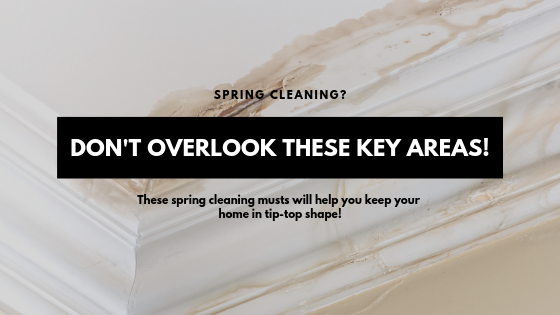 You can also see the crew set up plastic tarp around the kitchen to prevent dust and other particles from traveling through to the rest of the house. 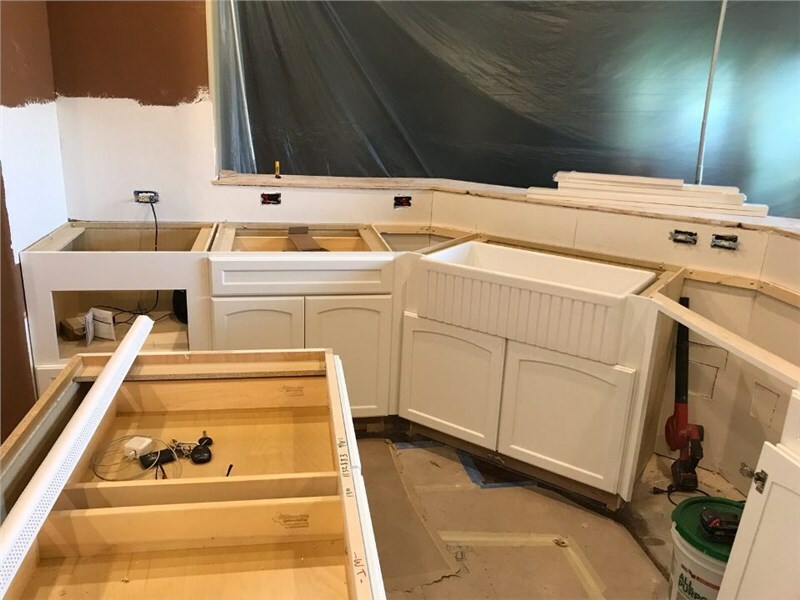 The kitchen cabinets seen in these “Work In Progress” pictures have already been refinished by craftsman Harold Allen (thank you Harold!). Immediately, you can see the space looks much larger with a light color on the walls. 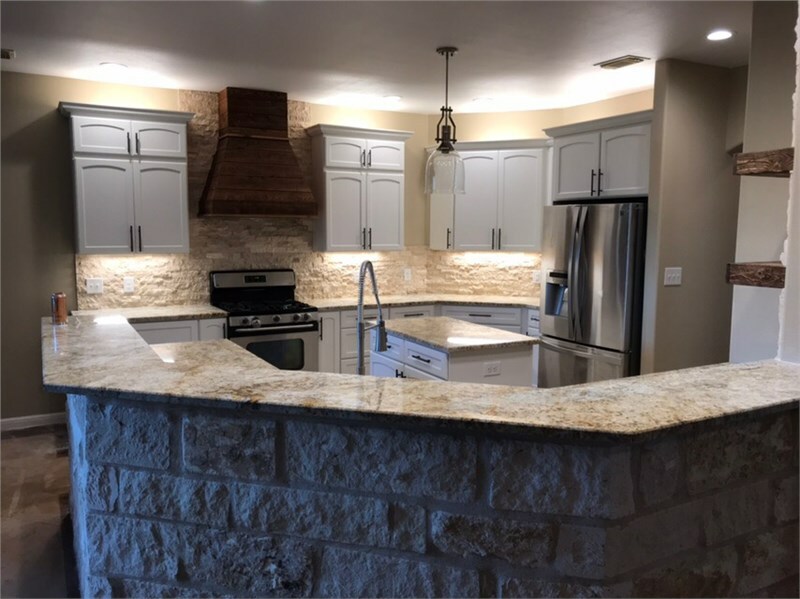 The stone backsplash has a rustic, Texas aesthetic while keeping in sync with the open, airy feel of the wall color. New wooden shelves and a clean-looking light fixture tie it all together. Extra lighting was added to the top and bottom of the overhead cabinets as well, adding functional visibility when prepping and cooking. Hardware was added to all the cabinets and drawers, and even the pantry door handle was changed to match the new additions. The countertops compliment the stone backsplash perfectly! The stone was carried through to the back of the bar-height countertop to tie the whole kitchen together. 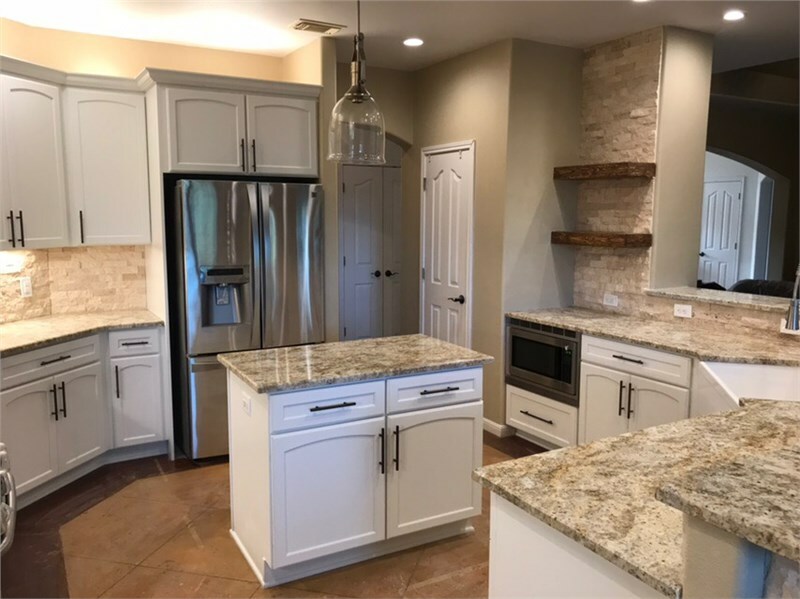 We love how the Boswell kitchen turned out! 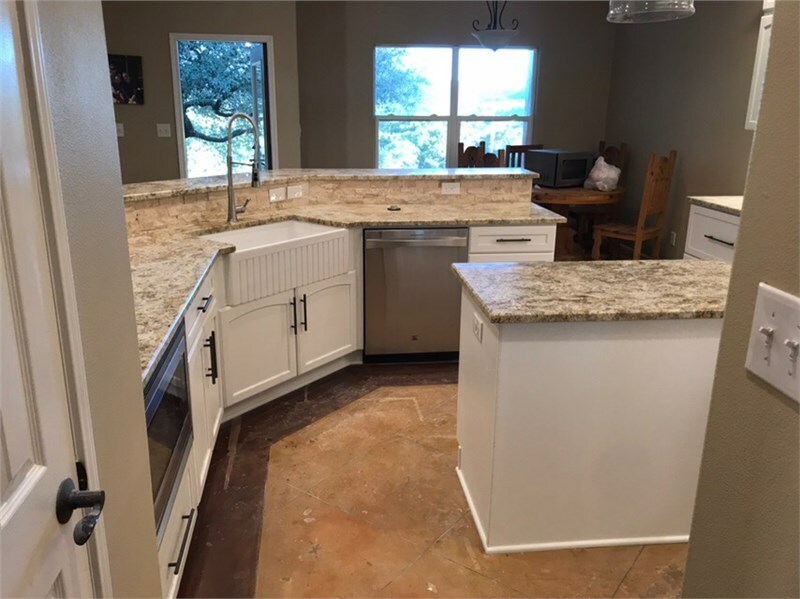 It takes the simplicity, clean lines, and openness of a modern kitchen and blends it with a classic Texas rustic feel. Thank you to project supervisor, Roald Sinopoli, for taking some awesome pictures and leading the crew to such amazing results! 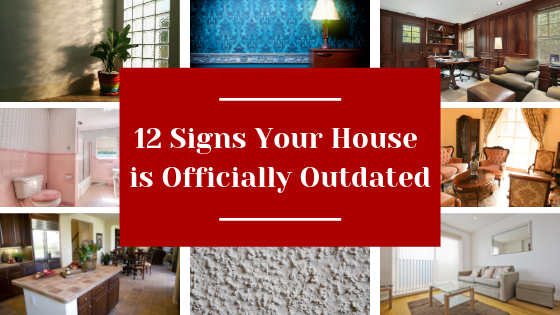 Are you ready to take your kitchen to the next level? We would love to complete more amazing projects like this! 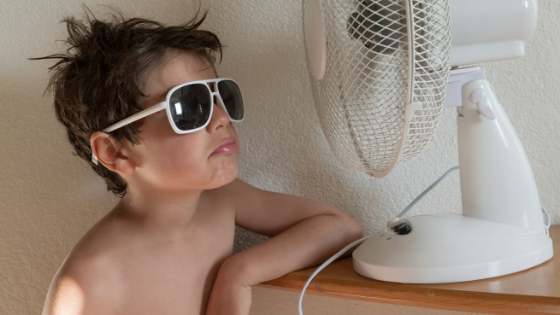 Tell us your goals and awesome ideas - contact us for a free quote!